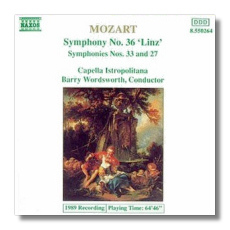 While hardly the last word in elegance or refinement, the two Naxos discs of six beloved Mozart Symphonies are never less than good, and, at times, far better than today's average. In Symphony 35, for example, everything clicks. Wordsworth gives us a lively and impetuous reading of considerable charm. While not quite up to the impeccable standard set by Thomas Beecham, this is a performance well worth having. In the remaining symphonies, the Capella Istropolitana generally plays well, although I found the white, frequently characterless sound of the violins to be monotonous after a while. At times (especially in the IV of Symphony 36) the string section was far too small and weak for the task at hand. On several other occasions (most notably at the beginning of III of Symphony 39), the strings simply aren't together. Wordsworth generally has a limited range of tempos - his allegros tend to be pokey, while his andantes are a shade too brisk. This lack of variety helps lend a dull and routine flavor to the proceedings. Nonetheless, occasional moments of brilliance do stand out (the opening movements of Symphonies 36 and 39) as lively, elegant, and spirited. The sound is claustrophobic and unnatural. I had the uncomfortable feeling that I was listening to recordings made in a very dry studio with artificial reverberation added later. Also, some instruments (such as the timpani in I of Symphony 39) are occasionally brought too far forward. The engineers have also managed to cut off the attack of the first note of Symphony 36. Still, if you're on a tight budget, this is an inexpensive way to make the acquaintance of these great monuments of Western art. The Giulini disc is another matter entirely. 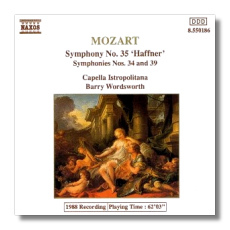 His Symphony 39 has the feel of a beautiful, languorous song from start to finish. At the same time, this performance has an elfin grace that is usually reserved for Mendelssohn's scherzos. Like Wordsworth, Giulini's range of tempo is limited - but his range of expression and tone color is most definitely not. And his broad, slow pacing allows a wealth of instrumental detail to constantly bubble up to the surface, such as the glorious bassoon and flute dialog at about 1:00 into IV. I has an intensity, tension and drama that is rarely found in performances of this Symphony. II is sensitive and deeply moving. 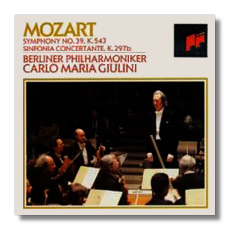 In Giulini's hands, it has the delicacy and intimacy of the best chamber playing. My only regret is that it didn't go on longer. III is taken much more slowly and deliberately than the norm. Still, Giulini's crisp accents and precise articulation produce a brilliant result. In IV, Giulini's relaxed pace reveals a multitude of details that are so often lost in the usual headlong rush to the finish line. Critical opinion is still divided over the authorship of the Sinfonia Concertante for Winds. I, for one, don't know or care who wrote it. The score abounds in wit, elegance, and the joy of music-making. The thematic material is endlessly inventive, and the writing for the four soloists is both idiomatic and graceful. With such credentials, the name of the composer is irrelevant. As in the Symphony, tempos here are on the slower side, and once again the conductor reveals a wealth of beautiful detail as a result of his deliberate pacing and subtle balancing of the solo and tutti voices. Sound is finely detailed yet warm and full-bodied. Robert Heinlein once wrote, "Never resist temptation. It might not pass your way again." His sage advice certainly applies to this very special recording. Copyright © 1995, Tom Godell.